“There has never been a better moment than the present to protect the planet for future generations” – Paul Polman, Global CEO of Unilever. 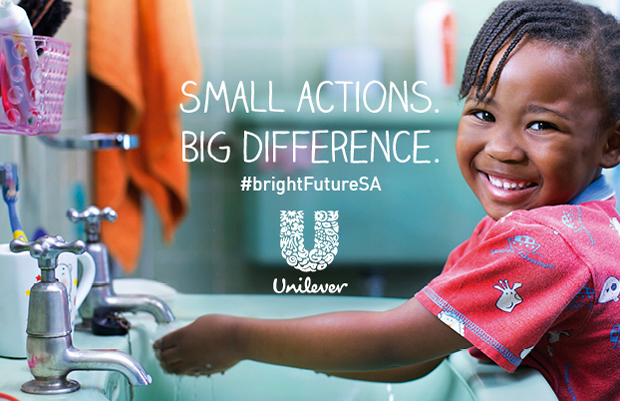 Unilever brightFuture launched in South Africa on 01 June 2015. It is a global campaign that demonstrates Unilever’s commitment to create a bright future for all. In South Africa, it aims to focus the public on the challenges facing the world today. The campaign began with a film titled “The Way Kids See It” – capturing the views of children from all over the world, including South Africa, on how to build a brighter future. Children dream of a better world. The future belongs to them, and Unilever believes that if we are to give them the world they want and need, we need to act now. “At Unilever we believe in creating a bright future for everyone in the world, starting with our children. As one of the top global companies we can’t sit back, watch the world fall apart and still expect to have a thriving business. It is everyone’s responsibility to change the way we do things if we are to create a bright future, and there is no better time to do this than now.” Says Queen Mgobhozi, Unilever Senior Brand Manager. In August, Unilever will showcase and celebrate people that we believe are our future South African leaders. Young men and women who are taking action to create a brightFuture for South Africa. Youth who have chosen to commit their talents and skills to positive change. One of these leaders is Thato Kgatlhanye. She has positively impacted her community and our country and represents the possibility of a brighter future for both South Africa and the world. A social entrepreneur, Thato saw an opportunity to make a positive impact in her community and now has a thriving business that changes lives. Together with a friend, they invented the Repurpose Schoolbag. Made from recycled plastic, the schoolbag includes a solar panel that charges while kids walk to school and transforms into a study light by night. We believe that honoring and sharing stories such as hers, will serve as inspiration for others.